Top Electricity Tips for the Outdoors - United Electrical Contractors, Inc.
Electricity. We use it every day. Most people would say that they have enough knowledge of electricity to keep themselves safe. However, hundreds of people die, thousands of people suffer injuries, and millions of dollars of property damage is caused due to electricity-related situations that could have been avoided with proper information and maintenance. Weather conditions combined with electric tools and other equipment can present hazards and safety risks not commonly found indoors. It is very important that you operate all electrical equipment properly and stay aware of all of the potential dangerous hazards so you can practice proper outdoor electrical safety at all times. Below we list the top electricity tips for the outdoors. When thinking about outdoor electrical safety, special precaution should be taken in relation to working with outdoor lighting systems as these can be especially dangerous in wet conditions. All of your outdoor lighting fixtures, light bulbs, and more should be weatherproof and protected by ground fault circuit interrupter (GFCI) breakers. If your bulbs need to be replaced or you are adjusting your outdoor lighting, make sure that you turn off your outdoor circuits beforehand to prevent shock and other dangers. When doing work outdoors, make sure that the equipment that you choose is weather-resistant and that it has heavy gauge extension cords specifically marked for outdoor use. Weather-resistant cords like these have safeguards added that have been designed to withstand the harsh conditions of an outdoor environment. Before you begin your work, examine the cord for frayed wires and other damage. If it is damaged, turn off the tool and replace it immediately. When storing your equipment, make sure that all of the outdoor extension cords are clear of all water and protected against any additional elements. Try to store them indoors if you have the space. Some outdoor work may put you in danger of working near overhead power lines, putting you at risk of suffering electrical shock. To maintain proper outdoor electrical safety, assume that every wire is energized and stay away from fallen wires and trees. Familiarize yourself with the locations of all of the power lines around your home so you can avoid those areas as much as possible. If a power line ever falls down in your yard, contact your utility company and a licensed electrician immediately. Do not try to deal with the situation yourself and risk getting injured. Your outdoor electrical outlets serve as a convenient way to get access to different outdoor electrical services including adding more light to your yard, operating any power tools you may need for yard work, and maybe even setting up an outdoor entertainment system. If you are utilizing your outdoor outlets for any of these electronic needs, it is essential that those outlets are maintained and properly protected. Take the extra time and precaution to make sure that they are safe in every possible circumstance. Here is some information on protecting your outdoor outlets to prevent damage or harm from coming to your equipment or electronics and to keep your family and home safe so you can enjoy your electrical amenities without compromising your safety. The National Electric Code (NEC) sets the standards for the safe electrical design, installation, and inspection of all electrical wiring throughout the United States to help protect people and their property from damage or harm due to electrical issues. The code expects and requires the use of GFCI outlets to maintain the highest level of safety. You can easily identify these types of outlets when you can spot the “TEST” and “RESET” buttons located on the outside of the outlet. The outlet should also advertise “WR,” declaring that the outlet is also weather resistant. It should be noted that these are the only outlets that are safe and intended for outdoor use. Everybody knows that water and electricity absolutely do not mix. Most outdoor outlets come equipped with weatherproof covers to help prevent water and dirt from compromising the electrical systems but once a device is actually plugged in, what happens next can be unpredictable. Unwanted moisture can make its way into the outlet which can then trip the circuit breaker and cause significant damage to the electrical wiring system in your home. 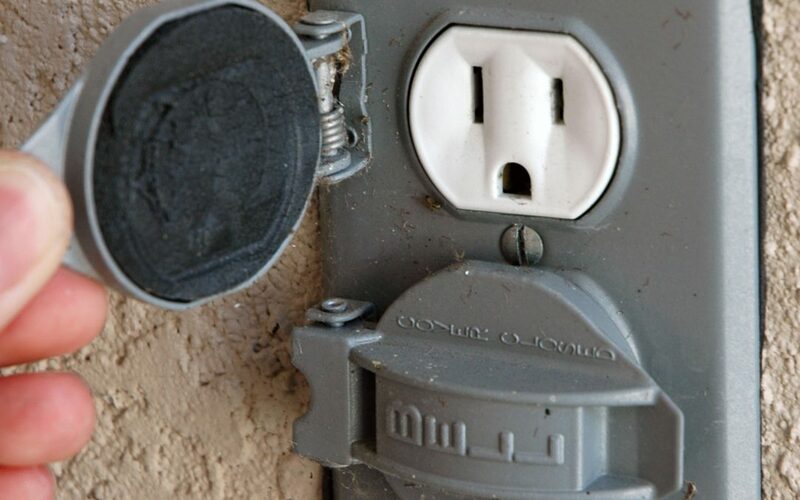 The common flip-up tabs that come on the outdoor outlets are only able to aid in protecting your outdoor outlets when they’re not actually being used. However, you can purchase an additional waterproof cover that when properly connected and installed will allow you to use the plug while still protecting it against water, even allowing you to use it in the rain and serve as a barrier against the elements. These outlet additions are commonly referred to as “flip-up” or “bubble covers,” and are typically clear or smoke-colored. The way they work is that they have been designed with a deep lid and groves that allow electrical devices and extension cords to run out of the bottom while still being able to protect the outdoor outlets from weather issues. Just the same as your indoor ones, your outdoor outlets are live sources of electricity with the power to create serious hazards and electrical issues if interfered with by water, moisture, or dirt, or not being taken care of properly. Protecting your outdoor outlets is extremely important because failure to do so properly can result in electrical fires, electrocutions, and electrical equipment malfunctioning. Never assume that the outlets that have already been installed outside of your home are safe or have been properly maintained. If you’re not sure, take the steps to contact an electrician inspect for proper installation. Electricity is useful and powerful but it can also be dangerous. Electrical safety is often followed in the home but it should also be observed when doing yard work and dealing with outdoor lighting. Practicing proper outdoor electrical safety is the best way to ensure the safety of your home and family while still allowing you to utilize your outlets for all of your outdoor electrical needs.